Chest of drawers in figured birch veneer, four graduated drawers, birch hardware with aluminum crescent hardware accents, recessed contrasting walnut base. 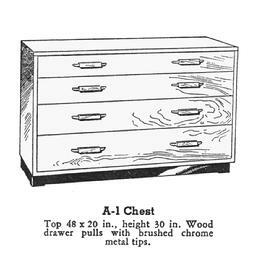 Generously scaled chest of drawers with horizontal emphasis seen in the extended hardware, the strong horizontal reveal surrounding the top, and the slight rear cantilever. 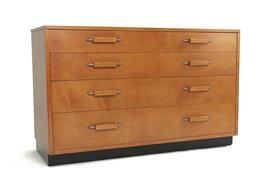 Graduated drawers show sophistication in both design and manufacturer; dust liners between all drawers. Nicely figured birch veneers, similar to the birch veneers Saarinen had earlier used in Finland. Raised on walnut base to emphasize the "floating" concept of much of the FHA offering.